Petroleum Products Induced- Cardiac Enzymes and Histological Changes in Wistar Rat Model: Is there any Implications for Cardiovascular Disease in Nigeria? Background: Some of the causes of cardiovascular diseases (CVDs) which have continued to increase in prevalence worldwide are unknown. It is known that petroleum products are abused widely in Nigeria. Objectives: We sort to find out if exposure of rats to petroleum products in the same manner that people inhale these products could cause significant cardiac toxicity. Methods: Our study involved exposing wistar rats to fumes of petroleum products. Group 1 was the control, groups 2 and 3 were exposed to varying duration of inhaled kerosene and groups 4 and 5 were exposed to varying duration of petrol. Blood samples were collected by orbital puncture and complete necropsy of the heart was performed and gross lesions recorded in all the animals. Results: The result showed increased serum levels of cardiac enzymes which included not only creatinine phosphokinase but also troponin I in rats exposed to petroleum products. There was also histological evidence of cardiac injury on microscopy. These results show evidence of petroleum products- induced cardiotoxicity in animals. Conclusions: If the implications of these animal research findings are extrapolated to Nigerians who are exposed to petroleum products on a continual basis, it may explain some of the yet unknown causes of cardiovascular diseases in Nigeria. In 2010, the three leading risk factors for global disease burden were high blood pressure 7.0% of global disability-adjusted life-years (DALYs), tobacco smoking including second-hand smoke (6.3%), and household air pollution from solid fuels (4.3%). Cardiovascular diseases (CVDs) are the number one cause of death globally. An estimated 17.5 million people died from CVDs in 2012, representing 31% of all global deaths, an increase from 30% in 2008. We now know that environmental pollution accounts for a significant portion of causes of CVD and yet air pollution is not included as a risk factor in the routine assessment of CVD. At least 39% of the risk factors and causes of CVD remains relatively unknown. [3-7] It appears that traditional risk factors clearly do not explain all the causes of cardiovascular disease in Nigeria, Africa and the world. There has been increasing studies associating environmental pollutants including petroleum products with cardiovascular disease. There is a need to fully assess the possible contribution of environmental toxicants to the blooming prevalence, morbidity and mortality of CVD. In a previous publication we had stated that environmental pollution in Nigeria had reached epidemic proportions. There are many industries that use kerosene and petrol and they openly discharge their effluent into the open with nobody to sanction them and that there is a policy of connivance with public health officials to circumvent the law. Urban waste treatment facilities are either nonexistent or are obsolete so that you find that wastes litter populated areas and food and water sources. The long term dependence on oil as a main exchange currency earner has made business to revolve around petroleum products. Petrol filling stations are cited indiscriminately with the result that people live next door to these depots. Sometimes there is leakage of petroleum products to water and food sources of neighboring houses. Kerosene is also stored in tanks in the same enclosure of many buildings. Very frequent petroleum products scarcity due to corruption in the petroleum industry has forced many people to store fuel and kerosene in places where inhalation often occurs without any realization of the harmful health implications. There are limitations in the study of human models in exploring the relationship between environmental toxicants and cardiovascular disease. Animal models provide a very important model for demonstrating the required cause and effect relationship. There is limited information available regarding cardiovascular systemic changes in rats and other mammals induced by exposures to environmental toxicants like petroleum products. This is because of the traditional belief that the target of toxicity will naturally be at the site of metabolism and excretion of bye products, the liver and kidneys respectively. The aim of this study is to find out the effect of inhalational exposure of petroleum and kerosene products to the cardiac tissues of wistar rats. Specifically, the objective is to assess the effect of inhaled kerosene and petrol on cardiac enzymes and the structure of cardiac tissues. The study assed creatine kinase-MB and also troponin I which have higher specificity than creatine kinase. Adult Wistar rats weighing between 145-169g were obtained from the animal house kept by the Department of Pharmacology and Therapeutics. Rats were randomly selected into 5 groups of six animals each. All experimental animals were housed in stainless steel cages in a well-ventilated animal house at room temperature kept under a schedule of 12 h light: 12 h darkness with free access to water and standard laboratory rat chow for 2weeks for acclimatization. Group 1 is the control group, Group 2 was exposed to 4 hours daily inhalation of kerosene (283 ppb), Group 3 - Exposed to 8 hours daily inhalation of kerosene (283 ppb), Group 4 was exposed to 4 hours daily inhalation of Petrol ( 229 ppb), Group 5 was Exposed to 8 hours daily inhalation of petrol (229 ppb). The method of exposure employed in this study is by inhalation in keeping with previous work by Udoh et al. . The exposure chambers measured 150 cm × 90 cm × 210 cm and contained two highly perforated 1000 ml cans containing 500 ml of kerosene. Cages housing the test animals were then placed within these chambers and the animals were allowed to inhale the fumes evaporating from the cans. The same procedure was adopted for the petrol fumes. In both cases, exposure lasted for 4 h and 8 hours daily for a period of 2 weeks. The time of exposure was from 9.00 am to 4.00 pm, after which the animals were transferred to fumes-free section of the experimental animal house. The animals were anesthetized with chloroform 24 hr after the last exposure and blood samples collected by Orbital puncture into plain sample tubes. Serum samples were separated 1 hr after extraction of blood by centrifugation at 3000 g for 5 mins and stored in a refrigerator. Biochemical analyses on the serum samples were done 24 h after sample collection. The cardiac tissues were harvested and processed according to the method reported by Udoh et al. 14Biochemical analyses were carried out for the measurement of serum creatinine kinase, Troponin levels, Blood. Laboratory kit reagents (Randox laboratory Ltd, UK) were used for all biochemical analyses. Ethical approval was received from the University of Nigeria Teaching Hospital Ethical committee with respect to guidelines for the care and use of animals in research and according to ARRIVE guidelines. Complete necropsy of the heart was performed and gross lesions recorded in all the animals. Only those in which the tissues have significant pathological changes will be selected for histopathologic examination. Samples of the heart was collected, fixed in 10% neutralbuffered formalin, and de-hydrated through graded alcohols before being embedded in paraffin wax. Several serial sections, 4-mm thick, were cut from each sample and stained with hematoxylin and eosin (H&E) and then prepared for microscopy. Data is presented as mean ± S.E.M. of six measurements per group. A one-way ANOVA was used to compare multiple group means. Statistical significance was considered as P<0.05. All statistical analysis was performed using the IBM SPSS Statistics Software Application. Table 1 showed that for all the groups, post exposure wistar rats lost weight and the longer the exposure the more weight lost. The heart organ weight loss was also more post exposure. However, the relative organ weight was not significantly different when the two exposure periods were compared for both kerosene and petrol as depicted in Table 1. Values are expressed as mean ± S.E.M, n=5. p<0.05, not significant with control compared to other groups. Key; Group 1- control group, Group 2 â Exposed to 4 hours daily inhalation of kerosene (0.283 g/mL) for 2 weeks, Group 3 - Exposed to 8 hours daily inhalation of kerosene (0.283 g/mL), Group 4 - Exposed to 4 hour daily inhalation of Petrol (0.229 g/mL), Group 5 - Exposed to 8 hours daily inhalation of petrol (0.229 g/mL). Table 1: Showing the effect of kerosene and petrol fume exposure on body weight and organ weight in Wistar rats. Table 2 showed the degree of kerosene induced tissue damage in this study. Most of the control had no abnormality. Most of the rats exposed to kerosene for 4 hours had mild tissue damage (83.3%). When the duration of exposure was prolonged more rats had mild lesions (50%) and there were also moderate and marked lesions (33.3% and 16.7%). Table 2: Showing the degree of myocardial injury and cardiac troponin I level following exposure to kerosene. In the group exposed to petrol, the control had no abnormality, those exposed for 4 hours had mostly no abnormality (66.7%), but a few had mild lesions (33.3%). On longer exposure to petrol, most of the rats had mild injury (50%); a few had moderate and marked injury (23.3% and 16.7%). Table 3 showed that there were significant increases in the levels of creatine phosphokinase, myocardial creatine phosphokinase (CKMB), and Troponin-I in wistar rats exposed to kerosene and petrol as depicted in Table 4. In all the exposed groups and for both petroleum products, the longer the exposure duration, the higher the cardiac enzymes released into the serum, indicating the degree of injury to the myocardium. Creatine phosphokinase and CK-MB levels were increased twice the control values by 4 weeks and tripled by 8weeks of exposure to kerosene and petrol. Table 3: Showing the degree of myocardial injury following exposure to petrol and associated cardiac troponin-I level. Table 4 and Figure 1 showed that serum levels of troponin I increased significantly following timed daily exposures to both kerosene and petrol. This demonstrated definite cardiac injury caused by inhalational exposure to kerosene and petrol in wistar rats. Troponin-I is the biomarker of choice for detection of cardiac injury. 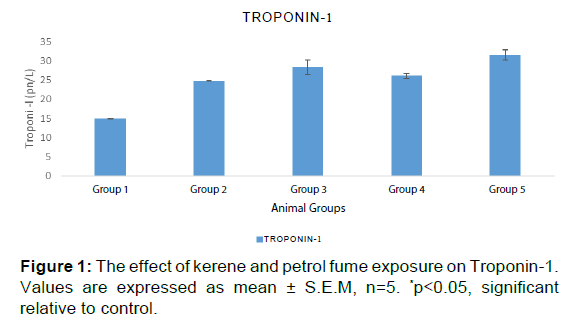 Figure 1: The effect of kerene and petrol fume exposure on Troponin-1. Values are expressed as mean Â± S.E.M, n=5. *p<0.05, significant relative to control. Values are expressed as mean ± S.E.M, n=5. *p<0.05, significant when control compared to other groups. Key; Group 1- control group, Group 2 â Exposed to 4 hours daily inhalation of kerosene (0.283 g/mL) for 2 weeks, Group 3 - Exposed to 8 hours daily inhalation of kerosene (0.283 g/mL), Group 4 - Exposed to 4 hours daily inhalation of Petrol (0.229 g/mL), Group 5 - Exposed to 8 hours daily inhalation of petrol (0.229 g/mL). Table 4: Effect of kerosene and petrol fume inhalation on Cardiac enzymes of wistar rats. 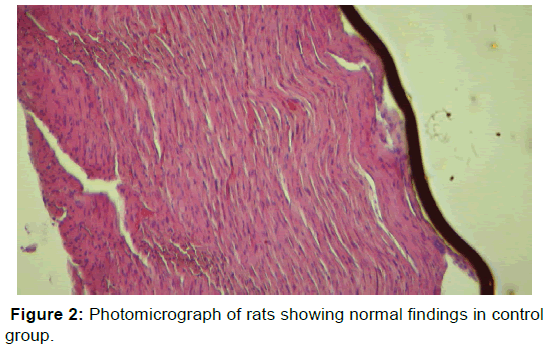 Figure 2: Photomicrograph of rats showing normal findings in control group. 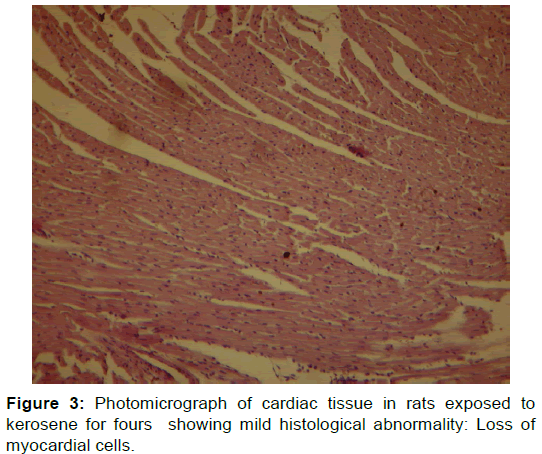 Figure 3: Photomicrograph of cardiac tissue in rats exposed to kerosene for fours showing mild histological abnormality: Loss of myocardial cells. 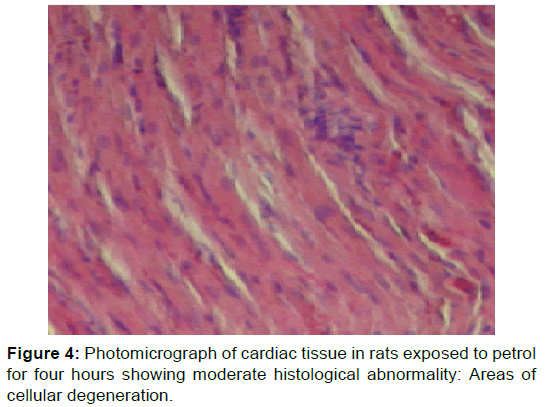 Figure 4: Photomicrograph of cardiac tissue in rats exposed to petrol for four hours showing moderate histological abnormality: Areas of cellular degeneration. 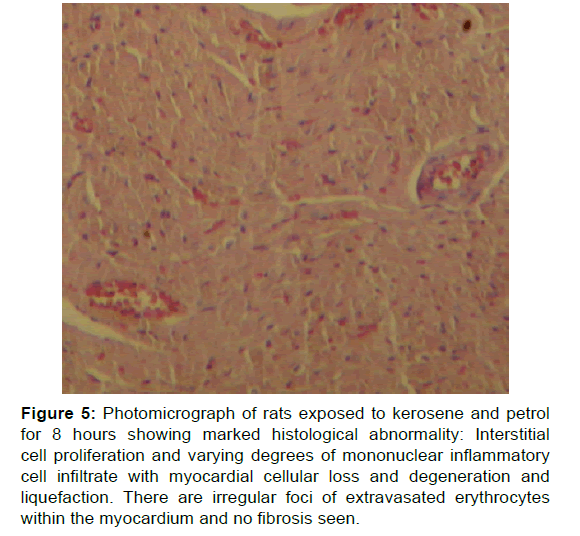 Figure 5: Photomicrograph of rats exposed to kerosene and petrol for 8 hours showing marked histological abnormality: Interstitial cell proliferation and varying degrees of mononuclear inflammatory cell infiltrate with myocardial cellular loss and degeneration and liquefaction. There are irregular foci of extravasated erythrocytes within the myocardium and no fibrosis seen. Troponin-I is the biomarker of choice for detection of cardiac injury. Troponin assays are not only more sensitive but are also more specific than CK-MB assays. The cardiac troponin found in blood may not be due to cell death only, it may also result from reversible myocardial injury. Mechanistic studies have shown that necrosis is not essential for cardiac troponin release and that even preload and integrin stimulation both have shown to cause proteolysis and cardiac troponin release. There is sparse literature report on petroleum productsinduced cardiac enzyme changes. This is understandable, since there are strict regulations governing the use of petroleum products in most countries. However, Azeez et al. had shown that elevated CK-MB level has been found with exposure to diesel, kerosene and petrol in Nigeria. This study found that there were increases in CK-MB in the animals exposed to the kerosene, petrol and diesel groups and our work is in keeping with their conclusions. The implication is that petroleum products can cause molecular and cellular cardiac injury and may be contributory to some of the cardiac diseases in Nigeria, given the widespread use and abuse of these products. The histological changes in the kerosene exposed rats were more advanced and widespread than that of petrol-exposed rats. This may suggest that kerosene fumes caused more myocardial structural injury than petrol fumes. Uboh et al. also reported that kerosene vapours caused more nephrotoxicity than petrol vapours. There were no significant structural changes using light microscopy in the rats exposed to kerosene and petrol for 4 weeks. This is inspite of the demonstration of increase in cardiac enzymes in the rats during the 4 week period. This showed that light microscopy may not reveal all the structural damage done by petroleum products. Electron microscopic evaluation may be more sensitive than light microscopy and may help to localize the primary site of toxicity. For instance in a 16-day study of bis (2-chloroethoxy)methane (CEM) of exposure in rats and mice, myocardial damage was observed via light microscopy in rats but not in mice, even though mice received doses twice as high as rats. Re-assessment of the mice using electron microscopic showed cardiotoxic damage, including mitochondrial vacuolation and disintegration. In another study, light microscopy showed only myocardial degeneration in a fourteen week study of bis (2-chloroethoxy)methane (CEM) in rats. But subsequent electron microscopic and ultra-structural evaluation of myocardium from rats administered CEM revealed that mitochondrial damage produced by CEM likely resulted from damage to mitochondria. This highlights the critical role of thorough electron microscopic evaluation in the detection of chemical-induced cardiotoxic effects. In addition to the findings of light microscopic evaluation, it seems that combination with special staining techniques or ultra-structural examination may provide more information on the potential mechanism of cardiotoxicity and in that way may suggest molecular studies that could further define the mechanisms of toxicity. Apart from enzymatic and histological changes, petroleum products have been shown to cause injury at cellular and molecular levels. For instance, JP-8 petroleum fuel vapour (1000 mg/m3) has been shown to not only induce significant cardiac damage including fibroblast scarring and inflammatory cell infiltration  but also cardiac molecular changes. These included reduced levels of mRNA for voltage-gated K+ channel protein, and increased levels of mRNA for atrial natriuretic precursor peptide (ANPP). These alterations in mRNA levels suggest that levels of these proteins were altered as well, although that possibility was not confirmed in this study. Properly working potassium channels regulate levels of potassium and calcium in the heart. Reduction of K+ channel function can result in ventricular arrhythmia and eventual heath failure. ANPP is expressed specifically in the myocardium of the atria and ventricles of the embryonic and fetal mammalian heart. After birth, ANPP expression is down-regulated transcriptionally in the ventricles, where it is reactivated again in situations of cardiac stress. Elevation of ANPP mRNA in this rat inhalation model is further evidence for JP-8 induced cardiac stress and damage. Our study showed that exposure to petrochemical products can cause both structural and biochemical changes in the heart of rats. Other cardiovascular effects of petroleum products include significant rise in arterial blood pressure, and heart rate. [31-33] Diesel exhaust inhalation has also been known to cause vascular dysfunction and impaired endogenous fibrinolysis. Though this work is an animal experiment and extrapolation to man needs to be carefully weighed but it seems probable that petroleum products which are available and used indiscriminately in Nigeria may contribute to the increased prevalence, morbidity and mortality of cardiovascular diseases. More studies are needed to provide mechanistic linkage between petroleum products and heart disease in human cardiovascular system. The public electricity in Nigeria is so problematic that more often than not the main source of electricity are the thousands of small electricity generators littered all over the homes and offices of millions of Nigerians. This state of affairs have ensured massive air pollution and exposure to petroleum products. Effective legislation may be required to streamline the use and storage of petroleum products in Nigeria with a view to check possible cardiovascular and other organ injury. Lim SS, Vos T, Flaxman AD, Danaei G, Shibuya K, Adair-Rohani H, et al. A comparative risk assessment of burden of disease and injury attributable to 67 risk factors and risk factor clusters in 21 regions, 1990–2010: A systematic analysis for the Global Burden of Disease Study 2010. Lancet. 2012;380:2224-2260. Collins DR, Tompson AC, Onakpoya IJ, Roberts N, Ward AM, Heneghan CJ. Global cardiovascular risk assessment in the primary prevention of cardiovascular disease in adults: systematic review of systematic reviews. BMJ open. 2017;7:e013650. Gersh BJ, Sliwa K, Mayosi BM, Yusuf S. Novel therapeutic concepts: The epidemic of cardiovascular disease in the developing world: global implications. Eur Heart J. 2010;31:642-648. Global Atlas on Cardiovascular Disease Prevention and Control. Mendis S, Puska P, Norrving B, editors. World Health Organization (in collaboration with the World Heart Federation and World Stroke Organization), Geneva 2011. World Health Organization. The role of CVD risk factors (WHO Global InfoBase Team). The SuRF report 2. Surveillance of chronic disease risk factors: country-level data and comparable estimates. Geneva: World Health Organization; 2005. Anakwue RC, Anakwue AC. Cardiovascular disease risk profiling in Africa: Environmental Pollutants are not on the Agenda Cardiovasc Toxicol. 2014;14:193-207. Lawal YO. Kerosene Adulteration in Nigeria: Causes and effects. American Journal of Social and Management Sciences, 2011. Faruq UZ, Runde M, Danshehu BG, Yahaya HN, Zuru AA, Muhammad AB. Comparative Studies of Gasoline Samples Used in Nigeria. Nigerian Journal of Basic and Applied Science. 2012;20:87-92. Babuin L, Jaffe AS. Troponin: The biomarker of choice for the detection of cardiac injury. CMAJ : Canadian Medical Association Journal=Journal de l’Association Medicale Canadienne. 2005;173:10:1191-1202. Schober KE. Biochemical markers of cardiovascular disease. In: Ettinger SJ, Feldman EC. Textbook of veterinary internal medicine. St Louis: Elsevier. 2005;245-248. Udoh F, Akpanabiatu M, Ekaidem I, Eteng M, Eyong E. Exposure to gasoline and kerosene vapours: risk factors for Nephrotoxicity in rats. Internet Journal of Toxicology 2013. Jokinen MP, Lieuallen WG, Johnson CL, Dunnick J, Nyska A. Characterization of spontaneous and chemically induced cardiac lesions in rodent model systems. The National Toxicology Program Experience. Cardiovasc Toxicol.2005;5:227-244. Babuin L, Jaffe AS. Troponin: the biomarker of choice for the detection of cardiac injury. CMAJ : Canadian Medical Association Journal = Journal de l’Association Medicale Canadienne, 173:10:2005;1191-202. Azeez O, Anigbogu C, Akhigbe R, Saka W. Cardiotoxicity induced by inhalation of petroleum products. Journal of African Association of Physiological Sciences. African Association of Physiological Sciences (AAPS) 2015. Jaffe AS, Wu AHB. Troponin release--reversible or irreversible injury? Should we care? Clinical Chemistry. 2012;58:148-150. Nyska A, Cunningham M, Snell M, Malarkey D, Sutton D, Dunnick J. The pivotal role of electron microscopic evaluation in investigation of the cardiotoxicity of bis (2-chloroethoxy)methane in rats and mice. Toxicol Pathol. 2009;37:873-877. 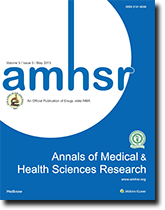 Dunnick J, Johnson J, Horton J, Nyska A. Bis (2-chloroethoxy)-methane-induced mitochondrial and myofibrillar damage: Short-term time-course study. Toxicol Sci. 2004;81:243-252. Hanas JS, Bruce Briggs G, Lerner MR, Lightfoot SA, Larabee JL, Karsies TJ, et al. Systemic molecular and cellular changes induced in rats upon inhalation of JP-8 petroleum fuel vapor. Toxicol Mech Methods. 2010;20:204-212. MacKenzie WF, Alison RH. Heart. In Pathology of the Fischer Rat (G. Boorman, S. Eustis, M. Elwell, C. Montgomery Jr., and W. Mackenzie, (eds.). 1990;461-471. Academic Press, San Diego, CA. Ruben Z, Arceo RJ, Bishop SP, Elwell MR, Kerns WD, Mesfin GM, et al. Non-proliferative lesions of the heart and vasculature in rats. In Guides for Toxicologic Pathology, STP/ARP/AFIP, Washington, DC 2000. Kodavanti UP, Moyer CF, Ledbetter AD, Schladweiler MC, Costa DL, Hauser R, et al. Inhaled environmental combustion particles cause myocardial injury in the Wistar Kyoto rat. Toxicol Sci 2003;71:237-245. Jokinen MP, Lieuallen WG, Boyle MC, Johnson CL, Malarkey DE, Nyska A. Morphologic aspects of rodent cardiotoxicity in a retrospective evaluation of National Toxicology Program studies. Toxicologic pathology. 2011;39:850-860. Balazs T, Ferrans VJ. Cardiac Lesions Induced by Chemicals.Environmental Health Perspectives 1978; 26, 181-191. Kemi M, Matsumoto H, Nomura Y, Takahashi R. Early myocardial lesions induced by cardiotoxic compounds in Sprague-Dawley rats. J Vet Med Sci. 1996;58:699-702. Combs AB, Acosta D. Toxic mechanisms of the heart: A review. Toxicol Pathol. 1990;18:583-596. Greaves P. Cardiovascular system. In: Histopathology of Preclinical Toxicity Studies (Greaves, P., ed.). 2000;254-311. Elsevier, Amsterdam. Steffe CH, Davis GJ Nicho KK. A whif of death: Fatal volatile solvent inhalation abuse. South Med J. 1996;66:879-884. Chalmers EM. Volatile substances abuse. Med J. 154:269-274. Coodley E. Diagnostic enzymology. Lea & Febiger, Philadephia. 1991;257-272. Mils NL. Diesel exhaust inhalation causes vascular dysfunction and impaired endogenous fibrinolysis. Circulation. 2005;112:3930-3936.